An internship on Capitol Hill changed her life. Alumna Sandra Latta wants to give current students the same opportunity. When Sandra Latta (Political Science ’84) first came to NC State in the early 1980s, she was certain she wanted to be an attorney. She even helped found the Pre-Law Club at NC State. Deep down, though, there was something else she really wanted to do. “I wanted to work on the Hill,” Latta confessed. “But to me, that sounded analogous to saying I wanted to go to Hollywood and be discovered.” Today, she serves at the Pentagon as Deputy Chief of Legislative Affairs for the U.S. Department of the Navy. You might say politics was in Latta’s genes. Her mother was the first woman ever elected to public office in Mocksville, NC. Her dad, J. Edward Latta (NC State, Agronomy, ‘50) was a WWII vet who was also involved with town politics. In high school, Latta took her first steps into the halls of government herself when she spent a week serving as a page at the state legislature. As a junior, she wrote to Congressman Bill Hefner to try to secure an internship, but the positions were filled. The congressman wrote her back, however, encouraging her to apply again at the end of her senior year. Latta did. Her one-month internship turned into a 14-year job with Hefner and, so far, a 27-year career. Through the years, Latta began to fully appreciate the importance of her internship. At an NC State function in Washington, D.C., Latta met Rick Kearney, director of the School of Public and International Affairs (SPIA), and asked him if there was any money available to help students with internships. There was not. Latta promptly established an endowment fund called the Latta Washington Internship Scholarship which provides $1500 each year for a student who has applied and been accepted into an internship program in Washington, D.C.
It’s an all-too-common and discouraging refrain, and Latta was tired of hearing it. “I just came across too many people—both here in Washington and in North Carolina—who said, ‘Oh I would love to have interned in Washington,’ but they couldn’t afford to come here. It broke my heart to hear it,” Latta said. Hayden Bauguess, a sophomore majoring in Political Science, is the first recipient of the Latta Washington Internship Scholarship. 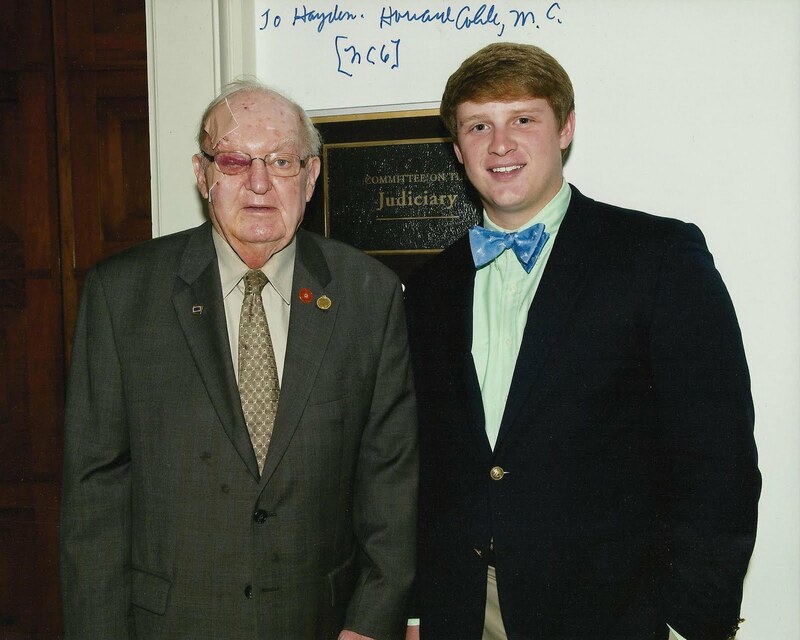 From May 16 to June 3, 2011, he interned for Congressman Howard Coble of North Carolina’s 6th Congressional District. Bauguess is pictured here with the congressman. That’s the point, said Latta: to make it easier for kids to pick up and go get real-world experience. Although it’s the money the recipient needs and that Latta provides, the real gift is the chance.